I am always asked so many questions about trading. Many of these questions are related to Forex because retail Forex trading is becoming more popular every day among those who want to have some extra income or even become rich. Why? People love to sit at the computer and make a lot of money from the comfort of their homes, by clicking on the buy and sell buttons only. Therefore, when they hear about Forex or currency trading, they get interested and start trying it, because it looks so easy at the beginning. But this can be the beginning of a long journey that doesn’t end to success most of the time. 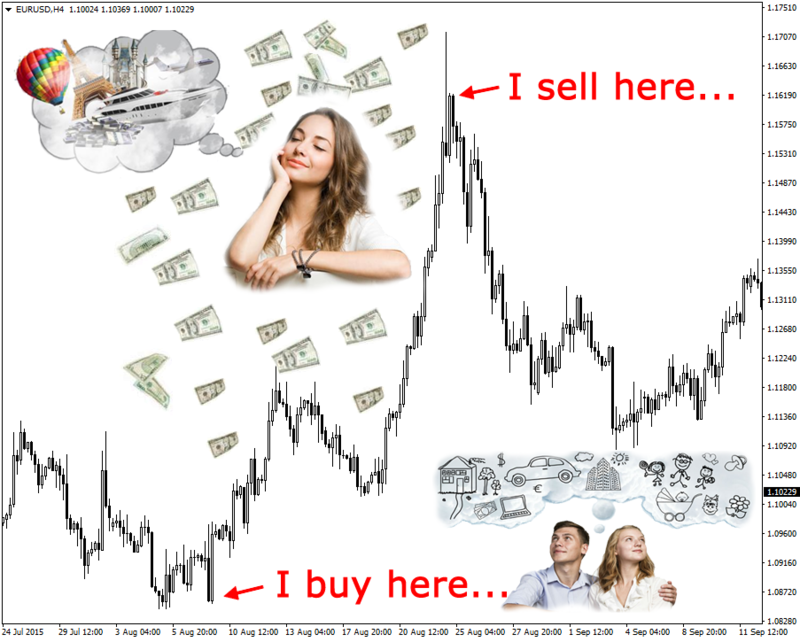 Is it really possible to make money through Forex trading? How long does it take to become a profitable Forex trader who makes money consistently? How much money can one make through Forex trading? Is it possible to become a millionaire through Forex trading? Do Forex brokers really pay the consistently profitable traders? Are Forex brokers happy with the small commission or markups they make through each transaction? Is this their only source of income? Do professional Forex traders trade through Forex brokers or they prefer to choose a different way? As you see, it is harder to answer these questions precisely and in details, because they are more specific questions that are usually asked by a group of people who cannot be convinced so easily. They have no problem to learn how to trade and become consistently profitable traders. They think about the next stage which is receiving the money they make through trading. Indeed, the questions these people ask is the foundation of this article. In this article, I am trying to talk about some facts and myths about Forex trading that all Forex traders, especially novice traders who are still learning or want to start learning, have to know. But the question is who really makes money there? So you have to be careful not to waste your time on something that you don’t know everything about. Trading is not an exception. You just hear that it makes money. But there are a lot more that you have to know about it, before you can make money with it. So let’s start from some of the more specific questions that smart and precise people ask about Forex trading. First, I’d like to answer whether it is possible to make money through Forex trading, or it is wasting of time? It is possible to make money through Forex trading. There are so many who are doing it. As a retail trader, you access the currency market through a broker. Your broker connects your computer to the limitless world of currencies. You install the broker’s platform on your computer and then you can place your orders on the currency market through the platform. Although it looks so simple, there is a too complicated process behind the scene. I have already written so many articles about brokers. Some of those articles are published on this site. I recommend you to read them to learn how brokers and liquidity providers work. Your broker is very important. It can make you lose money even when you are a good trader and you have taken the right position. Brokers offer their services to make money. They are not charitable organizations. They are after money and they do everything they can, to make more money. Government regulations can limit the ways that brokers cheat you (read this: 6 Ways Forex Brokers Cheat You). However, it cannot prevent all the cheating ways. It is not illegal to be a market maker broker, because being a market maker broker doesn’t necessarily mean that they cheat their clients (read this: Is It Bad or Illegal to Be a Market Maker?). However, the fact that your loss is the market maker broker’s profit, and visa versa, always makes us think that they should try to cheat and make more money, and prevent you from making profit. They don’t like you to make profit, because they have to pay your profit. Even if all market maker brokers cheat, still there is another option for retail traders: They can open their live accounts with ECN/STP brokers. You don’t have to open an account with a market maker broker. But the problem is the more common and popular Forex trading becomes, the more greedy Forex related companies, including brokers, will become also. It is becoming harder every day to know whether a broker is really ECN/STP or market maker. Unfortunately, in most cases, there is no explanation on brokers’ websites, clarifying whether they are market maker or ECN/STP. Even if they claim to be ECN/STP brokers, they don’t clarify how many liquidity providers their platforms are connected to, and who their liquidity providers are. Therefore, it is not clear whether they are true or false ECN/STP brokers (I have explained about the differences here). Market Maker Brokers: Is It Bad or Illegal to Be a Market Maker? There are so many brokers who claim to be ECN/STP, but it seems they are not. They accept too small accounts (like $100 accounts), offer high leverage (like 500:1) and micro-lots (0.01 lot). These are the things that true ECN/STP brokers that route your orders to strong and real liquidity providers, cannot offer. Although some brokers are known as ECN/STP brokers, they place the small accounts on a market maker system, because they know that almost all of those who open small accounts are not professional traders and will wipe out their accounts sooner than later. Therefore, the broker prefers to earn all the money these traders lose. On the other hand, liquidity providers don’t accept to work with too small accounts, nor do they support micro-lots. So, there is no option for the broker, but offering no service to those who want to open small accounts, or placing them on a market maker system that has no connection to liquidity providers. The huge money that market maker brokers make, is a big motivation for ECN/STP brokers to think about making more money. While the broker can make $500 from a $500 account when it becomes wiped out by the trader, isn’t it stupid to make $10 only and let the residue goes to the liquidity provider’s pocket? This makes the ECN/STP brokers think about having a market maker system at the side. A novice trader can easily wipe out a $500 by taking few positions. These positions cannot make more than few dollars for an ECN/STP broker because they only charge a commission. Even if they charge markup (which is illegal) also, they will not make more than $10-20. However, when the $500 account is placed on a market maker system, all the $500 is the broker’s profit when the trader blows up the account. This is what brokers know very well. After a while of working, ECN/STP brokers see that although they work too hard, the money they make, cannot even cover their expenses sometimes. Maintaining ECN/STP system, having constant and stable connection to liquidity providers and keeping the system up and running all the time, is not that easy. It is too complicated and needs a lot of work and money. That is not a big deal when the profit they make covers all the expenses. But it is a big problem when the money they make is not enough even to maintain the system and pay the employees on time. That is why the more popular Forex trading becomes, the harder it becomes to distinguish whether a broker is a real and true ECN/STP or a market maker, because many of them have both systems at the same time, and they don’t enlighten people about this. Most of the novice traders know nothing about these systems. They just open live accounts blindly. I know what I am saying in this post irritates the brokers, as well as the introducing brokers who make money by referring you to brokers. But fact is fact. So far, this website has prevented so many traders from losing their hard-earned money to the scams. This is what we will keep doing. The other problem comes when you are a profitable trader, but your account is placed on a market maker system, because you could not afford to open a reasonably big account to start, and so, you started with a small $1000 account for example. Just because you open a small account, the broker thinks that you are also a losing trader who doesn’t know how to trade and will wipe out his account after a while. Therefore, he places your account on a market maker system. However, when you make profit and grow your account consistently, the broker tries to do his best to make you lose (because your profit is his loss), not to allow you to withdraw any profit. They can move your account to their ECN/STP system when they see you are a consistently profitable trader. But they don’t do it because they prefer to make you wipe out your account and leave. Your first experience of live trading ends to failure. You lose the only money you could afford to open a live account. You either have to wait and save money to become able to open another account, or, you give up and forget about trading for good. Unfortunately, it seems it is becoming harder and harder to make profit with brokers these days. So, to answer the first question of the smart and experienced people which is: Do Forex brokers really pay the consistently profitable traders? I have to say, no. Consistently profitable traders have a hard time to receive the profit they make, if they want to trade with retail Forex brokers. The other bad news is that it is becoming even harder, as retail Forex trading becomes more popular and more people start trading Forex, because brokers become greedier every day. What does regulation do in this case? Regulation can be a big help, but unfortunately there are highly regulated brokers who cheat their clients even more. I don’t want to get involved in politics, otherwise I would explain this in more details. It is exactly where economy starts getting mixed with politics! The other thing is that regulatory organizations cannot track everything. There are always some ways to cheat the traders while nobody can detect anything. Can police be aware of all the crimes and illegal activities? Definitely not. It is the same with regulatory organizations. Another thing is that everybody knows that over 95% of traders lose, and many of them are used to accuse their brokers for their losses. So in most cases nobody pays any attention to the complaints of a retail trader whose $500 account is wiped out. The second question says: Are Forex brokers happy with the small commission or markup they make through each transaction? Is this their only source of income? No, they are not happy with the commission and markups, and so, they try to make more through cheating the clients, if they can. After the first two questions, we come to a more important question: Do professional Forex traders trade through Forex brokers or they prefer to choose a different way? Professional currency and stock traders know everything I explained above. They don’t risk the capital that potentially can make thousands or even millions of dollars for them. Therefore, they don’t trade through retail forex brokers. They trade through the highly reputable and well-known banks. This is true that banks don’t offer any leverage, and so, you have to have a lot of money in your account to become able to trade and make a reasonable amount of profit. But I believe this is an advantage. Most retail traders lose because their accounts leverage allows them to over-trade. When you take several positions with a $1000 account while the leverage is 500:1 (I see that some brokers offer 1000:1 or even 2000:1 leverage nowadays), you wipe out your account within a few minutes when some small economic news move the market for ~50 pips against you. What Does It Mean To You As A Retail Trader? I know that you are not happy with the facts I disclosed above. Unfortunately it is becoming harder to make money as a retail trader. It is because of nothing but greed. Everybody is after money. There is nothing wrong with this, but the problem comes when a party tries to make more than what it is eligible for, through illegitimate ways. But, be aware of the facts I revealed above. It is great to be a consistently profitable trader. So don’t give up and do your best to pass all the stages to become a consistently profitable demo trader. However, be careful when it is the time to open a live account. If you cannot find a true ECN/STP broker who establishes your account on a true ECN/STP system, don’t risk your money and don’t open a live account. Keep on demo trading and maintaining your trading skill until you can either find a good and reliable broker, or you save enough money to trade through a bank. Keep in mind that usually you will not have any problem with brokers as long as you are not a consistently profitable trader yet. They come after you and your account when you start making profit. Therefore, you cannot trust most of the positive reviews you see on the web. Many of them are made by novice retail traders who are not “consistently profitable” yet. You are lucky, because now you know about the facts I disclosed above, and so, you don’t lose your hard-earned money because of the brokers’ greed. Until you become able to have a professional trading and investment account, you can keep on demo trading and improving your trading skills. 1. They don’t offer any leverage. So you will not over-trade and you will have to take one good and strong trade setup at a time. Even if you lose, you don’t lose that much and your capital will be more secure. Your account won’t be wiped out, nor will it end to negative balance when too strong and sudden movements occur, simply because there is no leverage. 2. When you trade with the banks, you will have to trade the longer time frames, because scalping and day-trading don’t make sense with the banks. Banks don’t offer platforms like MT4. They make you trade like a professional investor and trader. 3. Banks don’t trade against you. As they are big financial organizations and have so many financial activities, they make their own money and they don’t care that your exchanges make money for you. They will be grateful when you have your account with them, and they don’t do anything to upset you, because they are professional and have to behave properly with their clients. This is what you hardly see with retail brokers. 4. The bigger positions you take, the better offers and prices you will receive from your bank. Keep in mind that trading with the banks is expensive. You have to forget about the 1 or 0.5 pips spreads when you trade EUR/USD for example. Banks charge a lot more. In spite of this, professional traders and investors trade with the banks. They trade the longer time frames and hold their positions for a longer time. Therefore, they don’t care about the spread. 5. Depositing and withdrawing your money is very easy with the banks. 6. Their support is great and they are always at your service. 7. They offer so many different things like mortgages, credit cards, gifts, points and… that you can never receive from brokers. 8. They educate you and give you a lot of free information. They have professional advisers and consultants that help you have the best trading and investment decisions. They love you to make money with your account and stay with them for a longer time. $5000 isn’t a reasonable account. It isn’t account that you can make a living with as a trader. But it is an account that can lead to tens of thousand with compound interest and it is the maximum many people starting from scratch can afford, expect from the people born from rich families. What do you consider as a reasonable account? 100.000? You can start from a $5000 account and withdraw the profit when it reaches something around $30,000 and start from scratch until your capital reaches $1,000,000 which is suitable to trade through the banks. I know it needs a lot of patience but trading is all about patience. I have seen a $7,000,000 account that was wipe out just because the broker didn’t trigger the stop loss orders. It was one of my friends accounts. I think I still have the statements. If this account was with a bank, it would never be wiped out. However, my friend didn’t listen to me and foolishly followed his greed and opened the account with a broker to pay a lower spread. And, that ended to a disaster. What I am trying to say is that you can hardly trust a broker to have a big account. It looks impossible to me nowadays. What do you think about turning 5000 into 20000, then withdraw half of that and put it in the bank; and then keep trading as you had all the 20000 in your broker account? Since with margin, you don’t need to use all the capital, you can trade the money without having them all avaiable in your broker account. So, you keep componding, while saving profit in your bank account. Otherwise, compound interest doesn’t make great effect, if you keep re-setting everything to the initial capital. I agree that having 7 millions with a broker is not intelligent. But if you have under a million, I think is not so bad. His account was destroyed because he used leverage, right? If you don’t use leverage or use a low leverage such 1:1, you don’t risk to have all your account wiped out, right? Yes, that is a good capital management strategy. > His account was destroyed because he used leverage, right? Yes. It was leveraged and the stop loss didn’t get triggered by the broker. I think he took three 100 lots positions. I think I still have the statements. They should be in my desk computer hard disk. I will share it with LuckScout followers. It is not only the success stories that have to be shared to encourage people. The failure stories also have to be shared to prevent people from making the same mistakes. > If you don’t use leverage or use a low leverage such 1:1, you don’t risk to have all your account wiped out, right? With a 1:1 leverage which is indeed a zero leverage, your account won’t get wiped out. However, you have to ask whether the broker sets a 1:1 leverage for your account or not. It is a broker side settings. You can’t change the leverage of your account on your own. Hi , so what should be a reasonable account to trade with a bank ? thanks . I depends how much money you want to make, and it also depends on the bank you choose. For example, a bank can offer you a good deal only if you open a $1m account. …the same goes for Swissquote of course. Citibank had allowed traders to open a $10k account on thier Mt4 platform. The horror stories (games) were the same as Private Brokers. They have since shut down their Mt4 platform and cancelled their relationship with a 3rd party provider of feed to their Mt4 platform. Deutsche Bank kicked their Mt4 to the curb. It’s getting tough out there! Be careful! Thank You in advance dear! Very interesting article, though a little depressing for someone who has just started and hasn’t got the millions necessary to trade with a banks. I have some important questions, if you don’t bother to answer. Which are the best banks to trade with? Do they have chart platforms like brokers, or the trade it is done by normal multicurrency account? Are they the ones you exchange money with, or do they connect you with others clients and banks not to have conflict of interest? What is the average spread when trading with a bank? Although is clear that most brokers are scam, do you think is still possible, for someone with little money, to find an ECN broker, become rich through it and then trade non-leveraged millions with a bank? Thanks in advance for the answers. > Which are the best banks to trade with? You can only open an account with the banks of your own country. For example, you can’t open an account with Bank of America when you are Malaysian, unless you have United States citizenship as well. So, you have to look for a good bank in your own country. > Do they have chart platforms like brokers, or the trade it is done by normal multicurrency account? Some of them offer some charts and graphs, but they are not like what MT4 does. The trades are done through having a multi-currency account, and exchanging the currencies to each other through your online banking account, or by phone. > Are they the ones you exchange money with, or do they connect you with others clients and banks not to have conflict of interest? They don’t connect you to any third party. > What is the average spread when trading with a bank? For the regular accounts, it is too high… sometimes over 250 pips. However, professional accounts get good deals sometimes as low as 10 pips which is nothing when you trade through the long time frames like daily, weekly and monthly. > Do you think is still possible, for someone with little money, to find an ECN broker, become rich through it and then trade non-leveraged millions with a bank? I didn’t say these to discourage retail traders. I merely revealed some facts that have to be considered. That is all. Thanks very much. I know you’re only writing facts, but as you can understand, for someone who want to become financial indipendent as all your readers want, it is not possible to have the huge capital necessary to trade through a bank, so, without a leveraged retail account, there is not hope for us, to become rich through and then being able to trade through the bank as you advice. That’s way is fundamental to us, to at least find one serious ECN broker to trade with. I knew you can open bank account to any bank, or it is not the case when it comes to trading account? What make the difference between professional currency account and a non-professional one? The money avaiable? Or do you have to tell the banks you’re doing active trading, and manage to get a low spread with a professional account? Can you tell us more about EBS platform? I heard it is an istitutional platform, where people can have access to many liquidity providers, but you need at least one million to trade with them and a bank account (as they do not keep money), but I don’t know is any bank is valid to use the platform and I don’t get which kind of agreements are needed to have access to the others market participants using the platform. It would be very helpful to explain this platforms and give us a better understanding of the istitutional trading. Thanks again. The banks ask you about your purpose of having a multi currency account. Some of them may not accept, but some of them accept it. I have never worked with EBS. Thanks. I really want to understand better how trading with a bank and the EBS platform work. Do you think the people working for you in the millionaire club are knowledgeable enough to give all the clarifications I need about the matter? You’re the best source on net for people like me, who still have a lot of things to learn about the world of trading. I mean not for living! Just to have the possibility to trade and make one extra income! this is a really great article. It is better to know a lot more information about brokers, to know with whom we are dealing. Please, is it normal to broker increase spread during the news for 5-6 times? I ask this because my SL was hit in one short position, although it was set 20 pips above highest price of that day, and normal spread is about 2 pips. The explanation was that it happened because of the news that were published that day. Please also note that it only makes sense to have an increase with the spread, only when the broker is a TRUE ECN/STP broker. However, you see that market maker brokers also increase the spread during the news release. This is nothing but a joke, because a live account with a marker maker broker is like a demo account. It is completely isolated from the real currency market. and now in my broker’s platform new daily candlestick is opens one hour earlier than in NY time platform. I’m using trading platform with NY closing time for chart analayze, and another one with real account for trading. My question is, should I wait to candlestick be closed on my NY closing time platform to open position on real account,or I can enter one hour earlier based on my broker’s platform ? Any of them are OK. The markets usually don’t change that much during those hours. Hi,can you answer some questions? 1.If you save your money(5000-10000$) and you find true ecn/stp broker,is possible to grow account to 100.000$ and then withdrew it? 2.There is no profesional profitable trader who trades with 50.000$ account (Which he grow it from 5000-10000 account)and he want it to grow to 100.000$ and then withdrew it on real ecn/stp broker? Everbody who is profesional profitable trader they put 5000-10000$ in bank and trade with that money? Or they put more than 10.000$? 3. Will you be notified if they move your account from ecn/stp to market maker system? Why they will move it? Every strategy has losing streak ,do they will just move it to market maker because of losing money of losing streak? 4. Can they manipulate candelstick, so it will look different. I mean when there is bullish candlestick on ecn/stp broker can they make on market maker system bullish candlestick into bearish candlestick so your orders get hit? 1. I recommend you not to let it go beyond $50k. 2. You can trade with a $10k bank account but your profit will be very low, because there is no leverage. 3. You won’t be notified. The move the losing accounts to market maker system to have all the losses as their own profit. 4. They don’t manipulate the candles. The manipulate the spread, markup and anything that can’t be on the charts. Should the bank a government bank or commercial banks? How do we find out if the bank also have trading department? Do they publisise in their website? How minimum amount they allow to open live account? You have to ask your country’s banks. They can be different from each others. Some of the strongly support trading and investment. Some of them avoid it. That was off topic my friend. We are not talking about trade setups in this article. I am sorry about that. Thanks very much this was very informative! You made me curious to look for reality in market. Working with the bank could be a good choice either. Always you offer us GREAT and very INFORMATIVE articles. I’m so gratefull to you. I have a question for you as well. What do you know about the cTrader trading platform made by a company called Spotware Systems. They say that this plaform works only with ECN/STP type systems and brokers. Is that true or is it just another lie? MT4 works both with market maker and ECN/STP. I don’t think a platform can be limited to one system only. I am not familiar with cTrader, but what they say doesn’t make sense to me. Therefore, research and investigate more before you trust them. Depressing indeed. The scenario for small traders seems to have changed quite dramatically in the short time I have been following this site (about 18 months). It was quite encouraging when I first started with Luckscout (then keys), and it did seem that, with a lot of patience, and by following the trading style advocated on this site, small traders could in fact make consistent profits. Now, it appears there is next to no hope of achieving that. We are now told that the only “safe” way to trade is by using the banks (out of the reach of most small traders, and certainly out of my reach). Yes,, the post is really discouraging. I hope there is some more positive way. I understand that you are merely “pointing out some facts”, but, with the situation as you describe it, anyone venturing into trading as a small trader (outside of the banks), must be more than just a little bit foolish. Is there really no way, nowadays, that the wanna be trader has a chance? It used to be 5%, but what is it now? 1% maybe 2%?. Those are really very, very poor odds indeed. What say you,? I think you have misunderstood me. I didn’t say the only safe way to trade is through the banks. And, I didn’t say that small (retail) traders can’t make profit consistently. Please read the answers I have given to some of the other commenters also. You can trade with a broker, but I don’t recommend you to have a big account with them. You can start with a small account, grow it to about $30k, and then withdraw the profit and start from scratch until you can open an account with a bank. It is up to you if you like to open a big account with a broker. You do it at your own risk. I don’t think you would appreciate if I referred you to a MM broker which is what most other sites are doing, and then you would lose your money to the broker. Instead of doing that, I prevent you from losing your hard-earned money. At least making no money is better than losing all of your money and savings. Do you agree? I doesn’t make any difference for me if you make or lose one billion dollars every day. However, I like to enlighten people who refer to this site. I can’t encourage them to put all their savings in a live account with a broker and then losing it all. I have seen so many sad things happened to those who don’t listen to the others advice and risked their hard-earned money. Currency trading is becoming riskier every day. This is what you can’t ignore. We are having a sudden and big movement once in a while and more frequently these day. These movements can leave the retail traders a negative balance, which is their own responsibility to pay to the broker, and the broker can prosecute them for that. Now, more brokers ask for the list of your assets before they agree to open an account for you. Do you know what is it for? It is to cover the negative balance that your account can end to. Now, you want me to ignore all these facts and encourage you to open big accounts with brokers? We can never do it. Thanks a lot for this article and your answers here. If we have a position open and one of those events happen and go against us, wouldn’t it activate the stoploss (let’s suppose we trade with a real ECN broker)? I’ve recently started to trade and in one of my trades my broker activated my stoploss 26 pips below what it was supposed to, and told me that the volatility created slippage on the stoploss. Yes, your stop loss is there, but the problem is it can’t be triggered, or be triggered several hundreds of pips away from where it was set, when the price is moving like crazy. This is one of the most valuable articles. As you said in the comments, more bad movements comes these days and can result in a negative balance. That would be the only reason I would leave. I really don’t want to leave it, so I have to ask a question. Is there any risk that a tsunami movement could happen even after taking the 100 score setups? let’s say we trade $10k (with no leverage). How much below 0 can the balance be (in worst case)? Thank you for the information it is really valuable! > Is there any risk that a tsunami movement could happen even after taking the 100 score setups? Yes. These movements have nothing to do with the trade setups and historical data and price movements. > Let’s say we trade $10k (with no leverage). How much below 0 can the balance be (in worst case)? Your account won’t end up to a negative balance when there is no leverage. It happens only when your account is leveraged. Thank you for another interesting article about trading! As we can see, trading is getting harder and harder. It has a lot of inconvenients. Don’t you think it’s more reliable a safe to trade futures and shares? I would appreciate your comments. Thanks in advance!! Futures and shares can have the same risks when done through brokers. thank you for sharing such information; that is hard for us to dig for it. Could retail currency traders and legit ecns band together and lobby against these shady brokers until the laws are changed that protect and favor retail traders? I know in the us there exist so called regulated brokers however most are market makers. Are the regulated brokers any safer? So ecn basically means Bank? Is that a fair statement? I’m going to only try to look at this post from a positive perspective it indeed may come off at first frightening and discouraging if you allow your old ways of automatically assuming the worst , which we have been conditioned to think like that by advertising and media. But with a slight shift in perspective and thinking this can be seen as the best news we have heard on the site thus far! We now know the truth about the industry and what it really takes to participate and win! So i need 100k to do it right! Fine back to the drawing board, ill make 100k with a solution perhaps luck scout will provide or find one that solves my issues. I didn’t come this far t give up, I am unstoppable at this point. And you can be too! Thanks for the courage and heart to tell it like it is and not what we want to hear, this is transparency at its finest and took alot of heart and courage thanks you once again kind sir! Indeed, trading is only one of they ways to make money and is not necessarily the best and easiest way. There is no point to get discouraged and disappointed even if one day they don’t allow any retail trader to trade, or they close all the retail brokers. When a door is closed, there are still so many other doors open. You just need to look around and see them. When one is serious to become rich and financially free, he/she will do it anyway, be it through trading or some other ways. I fully support you on that Charles, thank you! The right words to say the true things. Giving up is not an option! Thanks to to openly share his knowledge and experience with us. We are bless to have cross his road. I don’t know if I have the right words to say it, but anyway, thanks to confirm my beliefs kind sir. Thank you for very valueable lesson. I love facts:-) Here is one more..
What makes a great chef cook is not brand new equipment in the kitchen and damascus steel knife, it is a skill and knowledge to make tasty meal with only few groceries and basic tools. 1) Is it our account balance only thing what brokers see on their radars and take actions against us or it can be position size too? 2) If position size is also in play, what position size do you recomed one to take when opening position? 3) We know that having a trading account with True ECN/STP required min. 50K USD. When one open his trading account with ECN broker and 50K account balance, is it possible after a while to withdaral money( no mater if we trade or not) and leave only, let’s say 5K on account balance and trade only with that amount of money what is left? 4) If one lose that 5K is it possible then to add only 5K on same trading account, despite the fact that 50K was minimum deposit at first place? 1) They can see everything. Your balance, your positions exactly as you see them on your MT4 terminal. They can even see whether your platform is online or closed, or whether you are using a robot to take positions, and……..
2) Most of the cheating the market makers do, are automatic and done by some special robots. So, it doesn’t matter what position size you have. They can hunt your stop loss or slip the price if they want. 3) You have to ask them. When $50k is the minimum account size, then they usually don’t allow you to withdraw and lower the balance. They say you can close your account and withdraw the whole amount. 4) It all depends on the broker. You have to ask them. I remember in an other article you said in order to trade, the minimum position size is $10k. acording to my understanding this means one can deposit less than 10k. When did this change? Is there no true ECN broker that offers account for less than 10k deposit? I was talking about the minimum lot size with true ECN/STP brokers which is 0.1 lot or 10,000 unit – for example $10,000. Many thanks. I can see your point. I have experiencing something new for me. I had two open position in profit account and yesterday, when my account balance was grow 40% with this two trades, brokers robot is closed one position with most profit and my second position is still running in profit. At least I know now what limitations are when you have open and profitable position. Only unanswerd question left for me is it because USA presidental elections or any other high risk event or is it normal inside setings. What ever the answer is, we have limitations and it is true that brokers will do anything to protect themselfs. Nobody knows what is behind the scene of the platform you install on your computer. There is a broker there who wants to make money at any price. He makes money out of your trades, and, has to protect himself as you also mentioned. Therefore, he does anything he can. Most probably, they have done this to protect themselves against having negative balance. I think this is just the truth and is always better now how the things work. You lose because you take the loss. It would be great if the broker allows us to be profitable enough to grow our account to $30k, $20k or even to $10k. If we are consistently profitable traders, the most important thing is that the broker allows us to withdraw our money whenever we want (as it should be). This way, we could withdraw our profit, for example, every month, leaving in our account only the minimum capital to trade and calculating our risk according to the money in the brokers account plus the profit we have in our bank. However, according to your words in the following paragraph, you are saying that the brokers will not allow us to withdray ANY profit! “…when you make profit and grow your account consistently, the broker tries to do his best to make you lose (because your profit is his loss), not to allow you to withdraw any profit. They can move your account to their ECN/STP system when they see you are a consistently profitable trader. But they don’t do it because they prefer to make you wipe out your account and leave”. Yes. When the broker is scam, then they do their best to prevent you from growing your account. Maybe they don’t do it the first time, but they don’t tolerate it, when they see you are consistent. I would appreciate your comments about. Your approuch to Capital Managemant and fund allocation make sense to me. How I see’s article is a message to do not get carried away with growing your real account balance to amount that can couse brokers ilegal actions.Stay low und under radar. If one continue to think like I have said in above paragraph, then he is nothing more then semaphore trader and they are not profitable in the long run.You know… Green-BUY, Red-SELL. For our entrys we need facts, common sense, Chart analysis, you name it and I am shure you know all that facts already. What is nonsense from my view is that many people worry about future but they can’t handle the present time.What I want to say by that is that many community members here,our dear friends, are not consistently profitable on demo account for at least six months and they already worry about how they can’t grow their Real account balance and become milionaires if they use broker service. Our perception related to any issues with this job, need flexibilty and ability to adopt in any given situation, just like open mind, so this article doing just that.Our mindset need to adopt and we need to adopt our actions and Capital Menagement. Very,very valuable tip given by and I think you got this message right just like many of us and I am glad because of you buddy. I wish everybody in this community get this message right and not allow their subconsciousness to destroy their trading account, so they have excuse to quit this job. This is a big test for them. Thanks for sharing your valuable information with us. As I know, If I had a multi currency account with a local bank in my country with existing currency of NZD,new formed setup of NZD/CAD(we are discussing about that since few weeks ago),was a good chance to sell NZD and buy CAD at the moment. But,if I would like to open a new multi currency account right now, will it be still possible to get benefit from NZD/CAD new formed trade setup? I should open an account with CAD at the beginning? Actually, I have no plan to open this kind of account right now, but I am just technically curious about how the deal in gonna be? You have to sell NZD against CAD. It means you should exchange your NZD to CAD. If you don’t have NZD in your account already, then it can cost you a lot of money to buy NZD now. What if NZD/CAD goes up instead of going down? Let’s say it reaches 1.0300. Then your $97,760CAD equals $94,912NZD which is a $5,087 loss. how to monitor the price movement in the bank? Some of them offer some price charts and web based platforms that can be used for price analysis only. But usually they are not good. You can use the demo MT4 a broker. Thank you for the more awaited article. I just feel that where there is money there is bound to be greed and fraud. A year ago some liquidity providers were fined. Deutsche Bank is currently in trouble with American Department Of Justice; this same bank’s employees were charged with manipulating LIBOR over 11-year period and were fined $2.5B last year. One can really see how we need to thread with caution when dealing with financial institutions. Thank you once again; you always enlighten us as ever. did not dish all the information here to make us scare. But to be wise. Yes, governments are getting more strict and new rules that limit trading related activities always come. Wow, it’s not totally surprising me, but it makes me wonder if there still some room for retail traders in this world. Anyway, thank you very much for your honesty, there are not too many people out there, in your type of business, that are ready to share this information. You are always a good source of information for all of us! Thanks again for sharing sir. There are always numerous doors opened to optimistic and enthusiastic people. Nothing can stop them. As I have always mentioned, trading is only one of the ways of making money. It is not the only way, and it is not necessarily the best, most profitable and easiest way. Yes I agree with you on that, Never ever give up is my inspiration. Since then I have gone through many things. I would love to know what’s behind the door of the Millionaires Club, but I cannot afford this amount for now. I really hope to be able to meet you in person one day. Thank you. Yes, your informations cleared my ideas, but there are still so many doubts in my mind; as I’m a newbie with no experience outside broker demo trading. For instance, I get you can trade with a bank with a multi-currency account, but does the multi-currency account have a main currency? With a broker, your account has a main currency, and everything is converted into this currency when you close a position. Does this work that way with a bank account? You say, the bank must to be from my country, but what I’m only citizen of the country I was born into, but I live abroad and I want to have an account in a foreign bank, which is not in the country I live in. I know that you can open bank accounts in every part of the world, doesn’t matter where you’re from, why isn’t it the same for trading account? Plus, the quotes of the bank, are they the same as the quotes you see on your metatrader account? Being the bank basically a market maker, is the spread fixed? Plus, in the interbank market, price move because the orders are positioned in different level, and you can get slippage if your order is to big, and there is enough liquidity, on the price level you have set your order. Does it work the same when trading with a bank, or you never get slippage for a lack of liquidity? These are the many questions I’m asking myself. I don’t khow if I have to see trading with a bank, as interbank market or as a market maker zone outside the real market. Would be very grateful if you could help us better understand the matter. Thanks. > does the multi-currency account have a main currency? > Does this work that way with a bank account? > why isn’t it the same for trading account? There is no such a thing as trading account with the banks. > the quotes of the bank, are they the same as the quotes you see on your metatrader account? No, they aren’t. I have explained this in one of my other comments. > Being the bank basically a market maker, is the spread fixed? They can be market maker, like liquidity providers. Their spread isn’t fixed. > Does it work the same when trading with a bank, or you never get slippage for a lack of liquidity? Thanks,. Hope not to bother you if I ask some others questions. Since there is a no a main currency, how does it work exactly? Let’s say you want to sell EUR/CAD. First you buy EUR and pay commission, right? Then with EUR you buy Canadian dollar and finally convert everything to USD. Does it mean you pay commission 3 times? Doesn’t it seriously compromise your final earning, or you don’t feel it by trading long timeframes? For spread I mean commission. Isn’t the commission fixed? You put one million in the bank account, and you agree with X percent of commission, that can be lowered if you grow a bigger account. Or can the commission change based on the pair and the day you trade? I have already explained this in my other comments. Please read them. Thanks,. Maybe I couldn’t explain myself well. I wanted to know if the commission is fixed. The spread is made by the interbank price plus the commission, but is it the commission fixed? For example you have 1 million, want to buy 1 million euro against cad. You buy the euro and the exchange it with cad, right? Or you just exchange euro with cad at the time you would close the position on a normal broker? If I got it right, it is the second case. But it is the commission always the same, for example, 0,5 percent of the total exchanged capital, regardless of the traded currencies? Does the bank tell you how much it is going to charge you everytime? Thanks again. You should already have the EUR in your account, and then change it to CAD if you want to go short with EUR/CAD. When you don’t have EUR, then you will have to buy it first which can cost you a lot, but you have to have it in your account when you want to trade currencies. The commission depends on the bank and the deal they offer you. They usually charge you less when you exchange bigger amounts. So it isn’t a fixed amount usually, but it depends on the bank. It is the bank that determines how to deal with each customer. You have to negotiate and get a good deal from them. They help a lot when your account is reasonable. This is an interesting topic with some warnings about the brokers. If you do not mind, Could you write more articles about “trading with the banks” in detail based on your experience? 1) I think you need to read that article and also this article one more time. You haven’t understood me properly. 2) Let’s say you are right. I have explained in this article that the world changes every second. Hope you don’t expect me to repeat the same things I have said several months or every a few years ago. Thank you once again for your utmost dedication towards our betterment. No offence, but don’t you think that you must have wrote this article along ago? Because everybody who is here, most of us are from middle class families and we took trading as “profession for life”. And now this made us a bit disappointed. Secondly, what if I inform my broker that I am a professional trader and ask him to put me in ECN system and aware him that I may make very good profits consistently. Having said that, my Broker has a very good repute in the town and I somehow trust them. 1) I have warned the traders against brokers since the first day I started writing on this site. At the same time, I taught them the trading techniques, because trading techniques and technical analysis is a science that can be used on all markets. The other thing is that things have changed a lot. I see that more traders are losing and it has become harder for novice traders to become consistently profitable. Sudden and strong movements wipes out the traders accounts more often these days. I merely report what I see. Whether traders trade through brokers or bank makes no difference for me. Neither brokers nor the banks are going to compensate me if I support them. The other thing is that is only one of the ways of making money, not the only one. You shouldn’t get disappointment in case you can’t make any money through. 2) Yes, you can tell your broker. why not? Then you can try them with a small amount of money to see how they handle your gains. If they are OK, you can add more money to your account. What would you say about spreading the risk among different good regulated MM Brokers and then build the account with the brokers instead of growing account with one broker. In this case one avoids putting all the eggs in one basket. That is better. However, you can still get hurt by the strong and sudden movements in case your account is leveraged. Thanks, your article is of course disappointing but extremely important for us who are starting. Can we have a section in this site where we can all report on our brokers verses tru ECN/STP then in any given week we know who the best brokers are for different categories of traders? Most of us in Africa hope to start at 500 -1000$ is there any hope at all? This article is an eye opener.I want to ask, is there a specific way the broker can make you lose by interfering on your trade? When trading through a bank I guess it is not possible to use stop loss? How would you handle a position if it goes to wrong direction? Do you check your positions more than once per day? > When trading through a bank I guess it is not possible to use stop loss? It is not like what you do on a platform like MT4. However, with some banks it is possible to set stop loss and target orders. When you trade with a platform like MT4, you set a stop loss order at a special price. So, when the price reaches that level, the broker’s system closes your position. It means if – for example – you are long with EUR/USD which means you have “bought” EUR against USD, and then the price goes down and reaches the level you have set your stop loss, the broker “sells” the the EUR you had bought against USD, and so, your position will be closed. When you trade through a bank and you change USD to EUR (it means you are long with EUR/USD) for example at 1.0883 and you want to stop your loss if the price goes down to 1.0219, then some of the banks make it possible to change the same amount of EUR to USD, or you set the order to change X amount of EUR to USD automatically. Some of them, or most of them, don’t have such a feature. However, they allow you to tell them on the phone or by email to have a pending order at 1.0219. It is the same with target order. As you have to trade the long time frames when you trade through a bank (because of the high spread), and you can’t be a day-trader (which is good), then you usually have enough time to manage your orders through your online banking account. So, stop loss and target can’t be any problem when you trade through a bank. Additionally, as your account is not leveraged, it will never get wiped out, or problems like margin call or stop out have no place. Also, you will never end up with a negative balance. However, keep in mind that trading is all about taking risks and trading through a bank has its own risk also. To make money through banks, first you have to be an experienced and consistently profitable trader who is also able to trade the long time frames and has enough knowledge about the economical situation of the countries that he wants to trade their currencies. Second, you have to have a reasonable account balance, otherwise the amount of the money you will make will not be enough and you can’t get a low price and good deal from your bank, and so you will lose a lot on the spread. Therefore, if you don’t know how to do it, you can lose a lot. I think a video is worth 10000 words. Here is an HSBC video explaining how to “trade” currencies with their Multi Currency bank account. Hope it clears up some confusion. Hello. I am a Clickbank affiliate. Can I promote LuckScout Millionaires Club on Clickbank? Thank you for your offer. However, as we have a limited capacity in LuckScout Millionaires Club and we close the door to the new members from time to time, we don’t want the affiliates to waste their time and money to promote it and then their referrals to be faced with a closed door. Therefore, we don’t allow affiliates to promote the club for now. i am more than 2 years with your site.on october 20, i have received some market analyze but need user name and password while i have rejistred my email address 2 weeks ago. can i see these analyze or these arefor members of LuckScout Millionaires Club’s? That email was sent to a wrong list by the staff’s mistake. That is for the millionaires club members. This bank exchanging topic has given me some doubts about the interbank market. The price changing we see on the chart, it is purely the result of the exchange between bank and big istitutions. Investiment banks, and hedge funds trade their money and their clients money with each others and make the price change, right? Soros influenced the price cause it traded though a prime broker. The bank took his orders and then send it to other interbank market participants, right? What I’m wondering is, if someone such a multinational exchange 1 billion or any other big amount, does it make any movement in the price, or the exchange within a bank, outside the interbank market, doesn’t influence the chart price? Hope I’m not being too confusing. I would like to understand the market process better, how the prices move. > Investment banks, and hedge funds trade their money and their clients money with each others and make the price change, right? Governmental and central banks’ transactions have a much stronger impact over the markets. They are the ones who make the price move. > The bank took his orders and then send it to other interbank market participants, right? > what I’m wondering is, if someone such a multinational exchange 1 billion or any other big amount, does it make any movement in the price, or the exchange within a bank, outside the interbank market, doesn’t influence the chart price? It depends how the bank behaves. If the bank works as a market maker, then the transaction doesn’t impact the price. 1)Central and governament bank don’t trade the market often, they influence the market more by their economical decisions. For instance, a bank raise the interest and the investment banks and financial istitutions buy the currency, making it go up, isn’t it right? It says one question for comment, so I’m writing here. Soros sold gbp to a level he knows the central bank couldn’t resist, but he sold it through the central bank. The bank sent his orders to others banks, because if his orders remained within the bank, they wouldn’t have been recorded on interbank market, right? I really don’t know what was going on behind the scene of what Soros did. When Soros sold GBP 10 billion pounds to the bank of England, he created a huge supply of GBP and there was no market demand for it in the market, so the BoE was forced to keep buying from him to keep The European Exchange Rate mechanism condition of maintaining the exchange rate within 2.78 to 3.13 Deutschmarks(DM). Soros has made GBP 1 billion profit from the transaction, because he knew fixing GBP to DM wasn’t sustainable and it will collapse since the German economy is much stronger than the British. The main lesson to take from this story that still applies today and will always apply to any market is supply and demand. If you know where is the supply/demand zones in any chart, then you can be a successful trader, because that’s where the big boys enter and exit. They also transfer huge amounts of funds for different purposes, not for trading and making money. For example, Japan central bank always has to sell JPY against USD to lower JPY value against USD to keep Americans interested in buying Japaneses products. Such a transaction cases Japan to lose money, but it is beneficial for them in long term. What I really want to know is, only the exchanges between banks and istitutions change the price. If they didn’t exchange money with each other we wouldn’t see a price change, cause even a 100 billions exchange doesn’t influence the price, if it exchanged within one single bank, I got it right? So, the discussions about people and multinationals buying a country currency in order to bought the country products and so increasing the currency value, isn’t true, because if the money are exchanged through one bank, it doesn’t impact the currency price, am I wrong? Sorry for the too many questions, I’m just hungry to know the market without doubts. Also, if you know books about the market structure and how the price moves, please tell me. Thank you so much, I’m very grateful for all the help you have given us. > I got it right? Even if a huge transaction to be done in one single bank, it still impacts the price, because the bank has to change the buy/sell prices it is offering to the other customers. Then if that is a big and important bank, the other banks can change their prices to follow it. So it can impact the price indirectly. However, keep in mind that each bank and liquidity provider can act as a market maker. They don’t have to connect all their transactions to the other banks. So what you say it true on one hand. Is it possible in reality to grow up a live account to $4.00 million with ECN Broker? Will the support to withdraw the money whenever I want to? Will it be safe enough to do so? I would never trust a broker to have a $4 million account with, no matter if it is ECN/STP or anything else. It is easy to be said than done. The other thing is that let’s say the broker is a really good broker and doesn’t hurt you. What would you do with the big and sudden price movements that happen every now and then? What if you get up one day and find out that not only the money is gone, but it has left you an account with a negative balance? Ok Thanks a lot so much. I got my answer. At first I want to grow at least $30k then I will withdraw it. After that I will trade from bank. But I will have to do it from foreign bank. How do u see now? I don’t think $30k can be enough for trading through a bank. If any broker denies to withdraw my money can I take any legal action? If it is possible then where to submit necessary documents? It depends on the broker’s country and the regulatory organization. Usually brokers don’t prevent you from withdrawing your funds. They prevent you from making profit. They make you lose. According to my understanding, when trading through a bank it is only posible to take long position? if not how do you go short? You buy and sell the currencies against each other. For example, when you sell USD against CHF which means you change your USD to CHF, indeed you are short with USD/CHF. I think I figured out my self. Whatever direction I want to go, money is needed in both accounts. For example if I want to trade EUR/USD, I will need money in EUR-account AND in USD account. Am I right? Sorry for posting 3 times.